How to Manage Your Kid’s Candy Consumption: Top 10 Tips! Halloween is a highlight for many kids, excited to dress up as their favorite character and eat endless amounts of candy. However, it can be more of a nightmare for parents concerned with their child’s nutrition and sugar intake. We know that most types of food enjoyed in moderation, with the occasional over indulgence, are acceptable, and this is especially true on Halloween. Who doesn’t enjoy a sweet treat or chocolate bar? While Halloween is the time to treat yourself to classic Halloween candy, it is important to try and balance your child’s candy intake while still allowing them to enjoy the holiday. As a parent, creating a balance between keeping your child active and allowing them to devour their hard-earned candy collection can be stressful. That’s where BOKS can help! First, we suggest visiting our Play of the Day page to access fun daily exercises, so you can get your kids moving before the sugar overload. Or sign up for our Burst Activity Breaks delivered right to your email box every week! What can you do with these tools? One idea is that you could create a game with your kids: 1 completed Burst = your child has won a piece of candy! 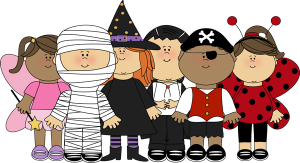 Have children pick up to 10 of their favorite treats to have the night of Halloween, and then put the bag out of sight. Following Halloween, set a limit of how many pieces they can have in a day. Eat a filling, healthy meal before trick or treating. This will prevent children from eating all of their candy in one sitting. Exercise prior to eating the candy to get the body moving so the sugar overload doesn’t make them off the wall hyper! Offer non-candy alternatives such as bags of popcorn, pretzels, trail mix, or small toys to trick-or-treaters that come to your door. Only purchase large bags of treats the night before Halloween to avoid having them in the cupboard weeks prior to Halloween. Consider buying back some candy from your child. For example, a Kit Kat bar could be worth $0.25 and a Snickers is $0.50. This way your child doesn’t feel like anything is being taken away and still provides a little treat for them. If your child is begging for more candy, try and appease them with fruit which is natural sugar. Encourage your kids to share their candy with others who may not have as much. Let us know on Facebook what you do to create a healthy balance between exercise and sugar intake during the Halloween holiday season!